An online survey will gather the experiences of lesbian, gay, bisexual, transgender and intersex people. The questionnaire is aimed at LGBTI people who are aged 16 years and above and live in the European Union. Neither sport participation nor discrimination experiences are mandatory to participate. An online survey, conducted by the German Sport University Cologne, will gather the experiences of lesbian, gay, bisexual, transgender and intersex people. The social campaign #yourvoicecounts accompanies its dissemination. As part of the Erasmus+ project Outsport, funded by the European Commission, the first European research on lesbian, gay, bisexual, transgender, intersex (LGBTI) and sport stars today. The aim is to provide an empirical basis and useful knowledge to develop new approaches and educational strategies to combat discrimination and prevent violence based on sexual orientation and gender identity and to facilitate the access of LGBTI people to sporting activities at every level. The Institute of Sociology and Gender Studies of the German Sport University Cologne, coordinated by Professor Ilse Hartmann-Tews, is in charge of the scientific research. The empirical basis of the scientific inquiry will be provided by an online questionnaire available at the link https://ww2.unipark.de/uc/Projekt_Outsport/ed19/ in six languages: English, French, Italian, German, Spanish and Hungarian. The questionnaire is aimed at LGBTI people who are aged 16 years and above and live in the European Union. Neither sport participation nor discrimination experiences are mandatory to participate. To promote the maximum dissemination of the survey through all the information channels and social media, the communication campaign #yourvoicounts also starts today. Photos and videos with testimonials invite people to be protagonists, telling their experiences and contributing to a better knowledge of their relationship with sport. 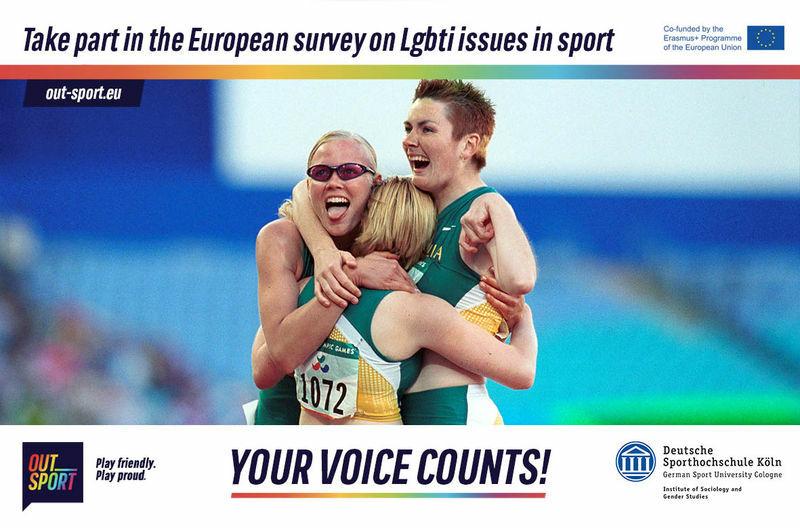 The whole campaign material in the various languages is available on the Outsport website at the link: http://bit.ly/outsport-survey-en The first findings from the survey will be published by the end of 2018. Outsport is a European project promoted by the Italian Association for Culture and Sport (AICS) with its Lgbti Department GAYCS and by the European partners LEAP Sports Scotland, Vienna Institute for International Dialogue and Cooperation (VIDC), FRIGO Hungary and German Sport University (GSU).